This article was written by Sarah Kaplan, Associate Professor of Strategic Management at the Rotman School of Management, and Jackie VanderBrug, Senior Vice President and Investment Strategist at U.S. Trust. What do we mean by “lens”? A lens allows us to see the world differently. 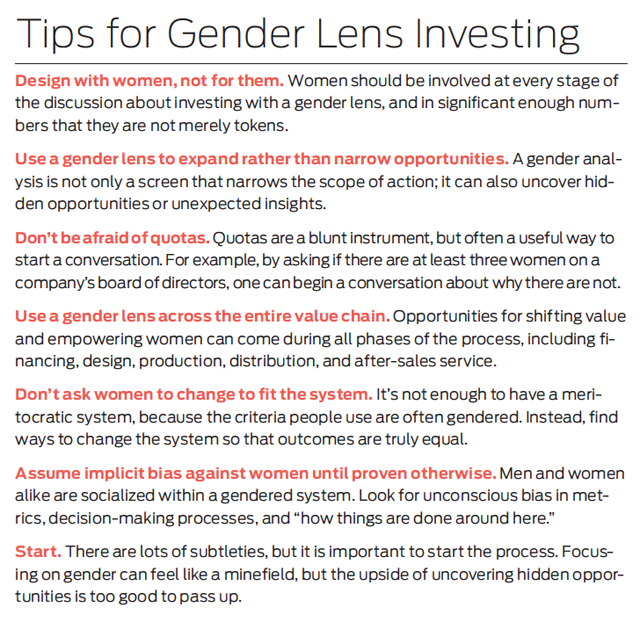 Looking through a gender lens helps investors gain new perspectives, highlight poorly understood inequalities, uncover new opportunities, identify blockages in the system, and find value where none was found before. Why gender and not women? Although it is focused on the impact of investing on women and girls, the movement uses the term gender to emphasize that making change means looking at the socially constructed roles, relationships, and expectations of women and men and the ways that these are reinforced by educational, political, economic, and cultural systems.3 Using gender brings both men and women into the conversation. The movement’s objective is to look at the entire financial and social system, not just at women. To understand how a gender lens can change the way investment decisions are made, consider the example of Root Capital, a nonprofit agricultural lender focused on increasing rural prosperity in Latin America and Africa. Root Capital invests in businesses that are too big for microfinance but unable to get credit from banks—what the organization calls the “missing middle” of finance. They not only lend capital but also offer financial training to help farmers and agricultural businesses access markets. Root Capital did not start with a gender focus, but in the course of its work, the organization learned about the challenges women face in accessing resources like credit, land, training, and agricultural inputs. A gender lens became a starting point for exploring new opportunities for action. Root Capital launched a Women in Agriculture Initiative based on the belief that gender-inclusive businesses—rated by a potential client’s percentage of women leaders, women managers, women employees, and women suppliers, as well as inclusive programs and culture—can create greater financial and social impact. Investing with a gender lens is about creating a new economic logic that bridges the market logic of financial returns with the feminist logic of women’s equality. Traditional investors often fear that a focus on women may make them too pink, and traditional advocates for women’s rights often fear that engaging with investors may mean they are selling out. Gender lens investing builds a bridge between these two worlds. It is not about investing in women as if they were commodities, nor abandoning feminism (with its roots in anti-capitalism). Rather, the movement promotes gender analysis as a way of reshaping the system to change what we value as we invest. Paying attention to gender is not just about having a social conscience, nor is it about adding to our list of environmental, social, and governance investment screens. Instead, gender capitalism is about applying a gender lens to highlight the ways that gender is material to financial outcomes and financial outcomes are material to gender. The goals of gender-focused investment vehicles are both to generate returns and to use the power of these investments to help push companies toward gender equity. Several trends point to the increased value of using a gender lens to look across an entire value chain. Take education: As women are increasingly educated, investors must consider which firms will win the war for talent. Governments like that of Japanese Prime Minister Shinzo Abe are seeing the economic benefit of women in the workforce and are establishing incentives for corporations that excel in gender diversity. Coca Cola has embarked on an ambitious campaign, called the 5x20 program (the goal is to empower 5 million women entrepreneurs across Coca Cola’s value chain by 2020), to leverage women’s participation throughout its business.13The Calvert Foundation, a social investing intermediary, found that the process of launching the pioneering Women Investing in Women fund (a gender-focused investment vehicle) energized its staff and created new client relationships and opportunities. Several lessons can be drawn from these three different approaches that will help investors use a gender lens to guide their decisions. The first is that systems matter. For investors, it is easy to focus on the specific investments without thinking of the systems in which they are embedded. For example, when microfinance works for women, it is not just because of the loans, but also because of the entire set of principles and programs that have been created to support women entrepreneurs. When the loan comes with technical assistance, a commitment by the women to have a different relationship with their husbands, and a loan compact that includes support groups, results improve. Similarly, encouraging women entrepreneurs anywhere in the world without confronting the biases in the entire funding system will not increase the number of women-owned businesses. Using a gender lens is about changing processes, not simply working within them. for an overview of the process and results of this value chain review as of 2014. 16 Global Alliance for Clean Cookstoves, “Gender Guide,” http://www.cleancookstoves.